An echidna wanders in front of a hidden camera and stops to drink from a puddle. The scene is nothing dramatic, but what happens next provides the first such footage taken in the WA Wheatbelt. A second echidna follows the first, then a second, third, fourth and fifth to create an “echidna train” as they follow the scent of a female. The short film clip, captured at the Korrelocking Township Reserve, has now been posted on You Tube and has had more than a thousand hits, generating plenty of interest amongst wildlife enthusiasts. Helping to film scenes like these are private landholders, keen to know what’s hiding on their Wheatbelt properties. Helping to coordinate some of the 50 or so camera traps in the region is WWF – Australia’s Mike Griffiths. “Camera traps are similar to security lights in that they are triggered by moving, warm objects,” he said. “Some cost less than $300 and can take up to one minute of video footage at a time. “They’ve been used in the Wheatbelt for a few years, but have really taken off in the last 12 months or so.” Bencubbin’s Russell Sachse is one landholder who’s placed a camera trap in 2000 hectares of his remnant vegetation. “I wanted to find out more about the breeding season of the Malleefowl,” Russell Sachse said. “This included mating rituals and the hatching of chicks. “I now have some great footage of Malleefowls, but some of that includes native wildlife being attacked by feral animals, which is of huge concern.” The Malleefowl is a large ground dwelling bird, slightly larger than a domestic hen. Once common, numbers have seriously declined over the last 100 years and the species has now been classified as "fauna that is rare or likely to become extinct" under the Western Australian Wildlife Conservation Act 1950-91. WWF – Australia’s Mike Griffiths said the camera traps highlighted the problem, with footage showing foxes coming into the area and sniffing out Malleefowl eggs. “Feral cats are a huge problem, but we also have footage of domestic cats straying kilometres from their homes, hunting native wildlife,” he said. While the cameras highlight the damage feral animals do, they were also designed to help landowners discover more about their own backyards. Natural Resource Management group Wheatbelt NRM wants towants to do this through its Healthy Bushland program. The program encourages private landholders to place a covenant on patches of land that contain remnant vegetation. Wheatbelt NRM’s Rebecca Palumbo is working with 12 farmers in the hope that 4000 hectares of bush will be protected in its original state forever. “We’re using camera traps in patches of bush to show land holders exactly what’s happening out there,” Rebecca Palumbo said. ”If people can see some of the native animals they already have on their land, they’ll be more likely to want to protect the area. “We have also purchased a number of camera traps to make them available to land holders and community groups next year. “A lot of people having exciting things in their own backyards and don’t even realise.” Mike Griffiths said other important finds included the Gilbert’s Dunnart in Cunderdin. This mouse-sized carnivorous marsupial used to be common in the Wheatbelt up until the 1900’s but wide spread land clearing destroyed much of its natural habitat. “People hadn’t known this species of dunnart existed in the local area until we caught one on video with the use of a camera trap,” Mike Griffiths said. 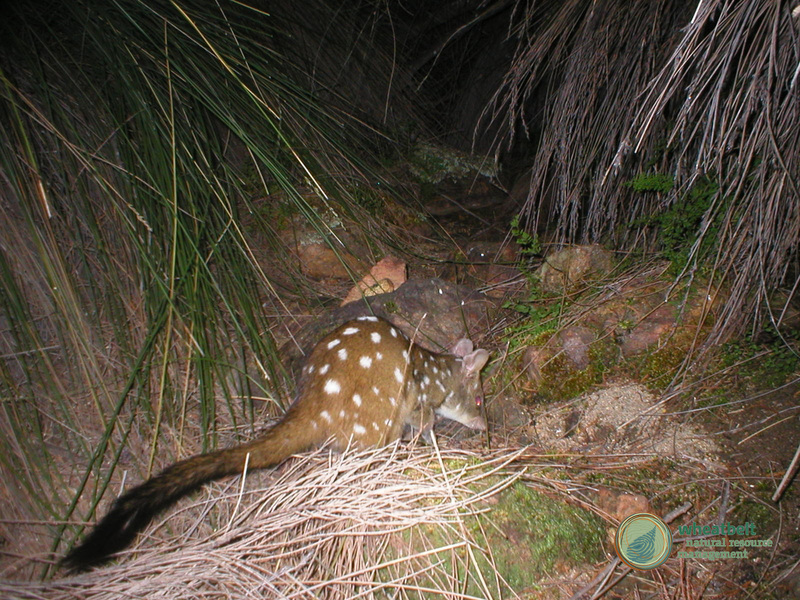 “We’ve also captured some footage of Quendas (a type of bandicoot) and Chuditches (a type of quoll, previously known as “native cats”) in the western part of the region. “Quendas are now very uncommon in the Wheatbelt and the Chuditch is declared as threatened fauna. “Both species have been decimated by foxes and cats but where they were found has been heavily baited, which reinforces the value of fox baiting.” The use of camera traps comes with a warning. Mike Griffiths said landholders needed to think about where they placed camera traps. “Placement of cameras needs to be away from nests and sensitive areas, as the intrusion of the camera trap and their infra red illuminators can disturb the animals and cause them to leave their young or eggs,” he said. “False triggers can be very frustrating too – these are anything that trigger the cameras into firing when there are no animals, and can include moving branches on hot windy days, insects and even the rising sun. “And you can’t just set one up in a patch of bush and expect to get great footage of native animals on the first day or night. “Typically we work on anything between a few days to a month when checking the camera traps out in the field, and sometimes all you get is a few rabbits, cats and a fox or two. “But there’s always the chance of a surprise and that’s what makes it addictive!” WWF – Australia colleague Phil Lewis has also been busy checking camera traps throughout the Wheatbelt. His footage of the echidna train has generated plenty of interest. “The motivation behind using YouTube was because so many people were keen to see such unique behaviour,” he said. To watch the footage simply head to www.youtube.com and type in “thephillewis” and scroll down to the echidna train and other camera trap footage. For more information on camera traps you can contact Mike Griffiths or Rebecca Palumbo at Wheatbelt NRM on 9690 2250.